MessagePal 1.6.3 is chat & instant messaging software developed by Grenox Software, Inc..
MessagePal provides simple, secure, instant messaging between users on your LAN. Only two minutes to download and install, MessagePal is a peer-to-peer system requiring no central server or administration. This cost-effective LAN messaging system provides unique workgroup features not found in consumer-oriented, ad-supported IM services or even more expensive enterprise messaging systems. Easy to use and administer. 1-Click Replies & Much More!! 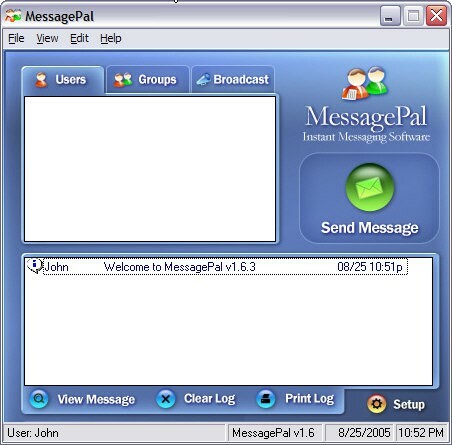 This communications software is shareware, which means you can download and use MessagePal 1.6.3 for free during the trial period (usually for 30 days). At the expiration of the period you will have to buy the chat & instant messaging product for $9.99. MessagePal 1.6.3 is available at regnow and Grenox Software, Inc. website. MessagePal 1.6.3 supports different languages (including English). It works with Windows 98/XP/Vista. We have tested MessagePal 1.6.3 for spyware and adware modules. The software is absolutely safe to install. We has completely tested chat & instant messaging software MessagePal 1.6.3 many times, written and published the interesting article and uploaded installation file (3126K) to our fast server. Downloading MessagePal 1.6.3 will take minute if you use fast ADSL connection.